In addition to all things whisky, we love nothing more than to pour and explore, and discover and uncover the wealth of other distilled delights on offer from the wide and very wonderful world of spirits. 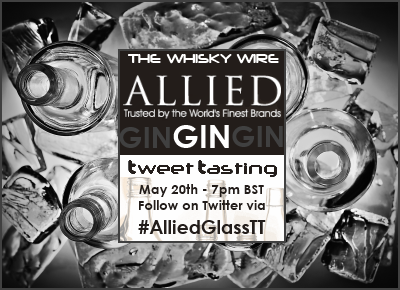 So much so that on May 20th we’re teaming up with glass packaging specialists Allied Glass, for an evening of gin ginery, gin ginery, tweet taste-ery. On the night we’ll be sampling and savouring a gaggle of glorious gins from brands including Bulldog, Caorunn, Greenall's, Langtons and Makar. All of which have had their bottles crafted and created by Allied Glass, the UKs fourth largest glass packaging producer and supplier to some of the world’s biggest drinks brands. The closing date to register is Friday May 8th, and if you are registering to take part please make sure that you will actually be free on the evening of May 20th to take part!! !